With two decades of financial and governance experience, Joan Hertz has been appointed as the new board chair of ATB Financial, effective Jan. 1, 2019. 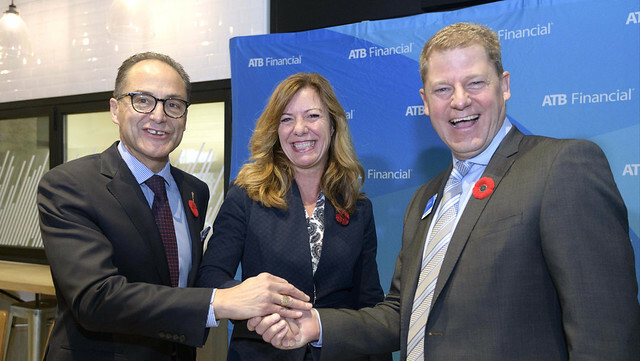 Minister Ceci (L), along with Curtis Stange, president and CEO of ATB Financial, welcomes Joan Hertz as incoming board chair. Hertz was first appointed to the ATB Financial board in June 2008 and served her full term, which ended in June 2018. As a lawyer with background in financial services and corporate governance, she has provided governance, and legal and strategic advisory services to private-sector and Crown clients throughout her career. The ATB Financial Board of Directors is comprised of the chair and 11 members. The new chair was selected following a transparent and competency-based recruitment process that included a public posting on the agencies recruitment website and the use of an external executive search firm. Reporting to the Minister of Finance, the chair provides leadership to the board, facilitates the work and development of the board and sets the tone for management of the board and overall corporate governance.